I’m entering seminary in a month. 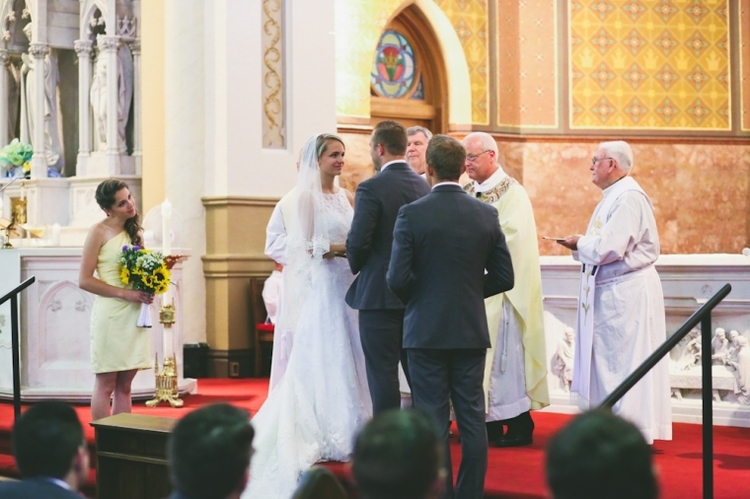 In March, you could already find me joking about how the two (young, joyful, Steubenville-birthed) weddings I was attending this summer were my “final test” before entering seminary. Strikingly beautiful Catholic millenials abound at such events, and though I spoke of the challenges of these looming festivals of Christ-like love with much jocularity, I was in fact hauntingly certain that my always-fragile self-understanding would be disturbed at some point. I am, shamelessly, but a man. A few days before wedding #1, hanging out with everyone who had traveled into town for the occasion, it happened. She walked into the room with grace, her smile luminous, her joy ineffable. She strolled–or did she float? I had no time to admire whatever her (undoubtedly adorable) feet were doing–across the room, and her eyes, passageways to worlds where agape reigns and red wine flows with unscrupulous delight, pierced right through… her boyfriend. I watched the whole scene unfold in wonder. The moment she caught sight of him; the way her gaze was reciprocated by his; the embrace. Mind you, all of this occurred in a time briefer than it took to read this paragraph. But when you “fall in love with human love”, as a young Karol Wotyla once expressed it, time is an afterthought, an annoyance, a distraction. A simple look cast into the eyes of another can speak eternity. The rest of the weekend, I watched this same chain of events unfold a handful of times, as husbands embraced their wives and fiances shared longing looks of anticipation, each time cutting deeper into my heart than the previous. What was it about this gaze, this simple glance between two lovers, that rocked me? I was in no way naive or ignorant of what, exactly, I committed to give up by choosing to enter seminary. I have, myself, been on the receiving end of that look in times past, though those memories have gotten awfully blurry (thanks to time and some concerted effort to simply forget). Yet, repeatedly I found myself pondering this question, never quite having enough time to piece it all together, to make total sense of what it was, precisely, that had gripped me. After all, I felt bad for staring. Memories of that gaze stuck with me over the next three weeks, as I prepared for wedding #2. (Maggie and Tim during their vows. That’s Alanna to the left, Maggie’s sisters, presumably thinking every word I’ve typed so far. Photo Credit: Pat McNamara from DrawntotheImage.com. This is not the nervous look of two timid ‘prudes’ who have “saved themselves for marriage”, nor is it the boring stare of two people blandly reciting legalistic words of unity, their bodily covenant having already been expressed long ago. This is the gaze of two human persons, ready to give of themselves entirely to one another, willing to allow themselves to be torn apart in love and suffering, prepared to heal one another by their own bruises: two lovers anticipating the consummation of their love. The day after the wedding, I shared my own reflections and questions about this gaze with a fellow groomsman. His response was simple, likely obvious to many, nothing I had not heard before. Yet for me, at that moment, it was the answer to the questions raised a month before, a key to unthinkable liberation, unlocking and releasing immense spiritual desire within. For the first time, the words “Beatific Vision” made a lot of sense. I returned from this wedding far more optimistic than I had the month before. Far from being a deterrent to my discernment of the priesthood or an obstacle to my journey, my encounter with “the gaze” intensified it. The forthcoming year (years, God-willing) of seminary is an opportunity for me to be schooled in allowing the gaze of Christ to be my satisfaction. My prayer this time was, “Lord, how do I find this gaze you offer me? Where, exactly, is it?” “The Eucharist,” to me, was too easy of an answer, not the wrong answer but simply insufficient, not penetrative enough. Contemplation is a gaze of faith, fixed on Jesus. ‘I look at him and he looks at me’: this is what a certain peasant of Ars in the time of his holy curé used to say while praying before the tabernacle. This focus on Jesus is a renunciation of self. His gaze purifies our heart; the light of the countenance of Jesus illumines the eyes of our heart and teaches us to see everything in the light of his truth and his compassion for all men. Contemplation also turns its gaze on the mysteries of the life of Christ. Thus it learns the ‘interior knowledge of our Lord,’ the more to love him and follow him. Yes, within each of us dwells the “inner Christ”, and a simple contemplative glance in His direction is met with a gaze that speaks eternity. But there is more. The problem I found as I began attempting to find my “gaze” in Christ was that, throughout the course of a day, I simply forgot. No matter how stellar my morning prayer was, or how intimate my holy hour may have been, hours later my day was simply carrying on as it always did. This didn’t seem right. Any good book on the Christian spiritual life begins with some words on the need for Christ to take center stage in one’s life and allowing everything else to fall into place around Him. This is often referred to in different ways–for Robert Barron it is “finding your center” and allowing Christ to be it, for CS Lewis and Michael Gaitley it is “putting first things first” allowing Jesus to be first in your life, for Jean C.J. d’Elbee it is spoken of under the theme of abandonment–but the point is always the same. Jesus has to be the at the heart of the believer’s daily existence, not merely given a sliver of the day to be focused on but the very fabric that enlivens every moment of every day. This pretty much brings us to the present day. I realize, now, that I need to learn to find that gaze of Christ not only in moments of personal or sacramental prayer, but in the eyes of others and in the seemingly ordinary events of my life. If I find His gaze in others persons or in His providence, I figure, I won’t be capable of taking my eyes off of Him. I’ve come to understand this as the four-fold gaze of Christ: in prayer, in sacraments, in others, in happenings. Again: simple lessons, nothing we haven’t heard before. But when cast into the language of genuine agape they take on a whole new dimension, for it is He, the beloved, gazing back behind all these various appearances, fanning the flames of an intimate relationship with the One in whom all of our spiritual, emotional, and, yes, physical desires are meant to be satisfied. This piece first appeared over at Reverb Culture, an awesome website/movement. Check them out. Original Post Summer 2014. Greg Hurst is a seminarian for the Archdiocese of Boston and a contributor to Reverb Culture. He attends Saint John’s Seminary in Brighton, MA. Since the initial writing of this article, Greg has completed his first year of Seminary. Follow him @gchurst.